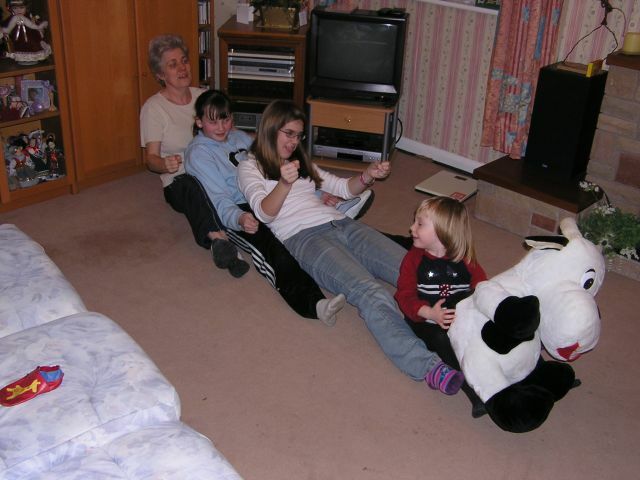 Ceri-Siân and Ann assisted by sKate, entertain young Helen by playing trains! 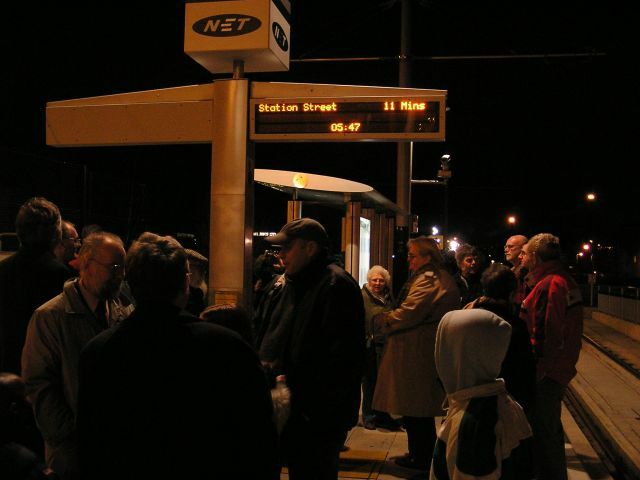 Breaking Shepshed curfew, two tram gricering friends and I got up very early to catch the first tram on the new Nottingham Express Transit (NET), for a full photo report and more see my NETTrams.net website. Easter our friends the Jeffery's came up and stayed. Rather then cycle we went for a few walks. One was along the Cloud trail which we have often cycled. Here is Ceri-Siân posing by the vulture sculpture. Can you tell which is which? Ceri-Siân has continued to play flute for the Shepshed Community Band. Here she is playing at home. At the end of last year Ceri-Siân was looking for another instrument to play. 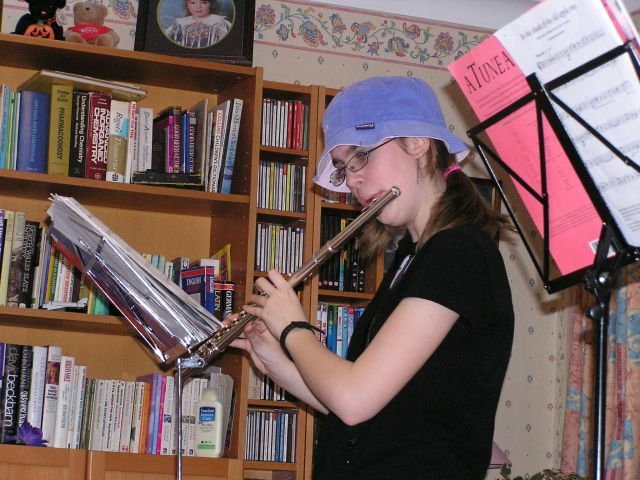 She chose the Bassoon as it is an endangered species. After researching the instrument and finding a teacher etc, we bit the bullet and brought one just before Easter. 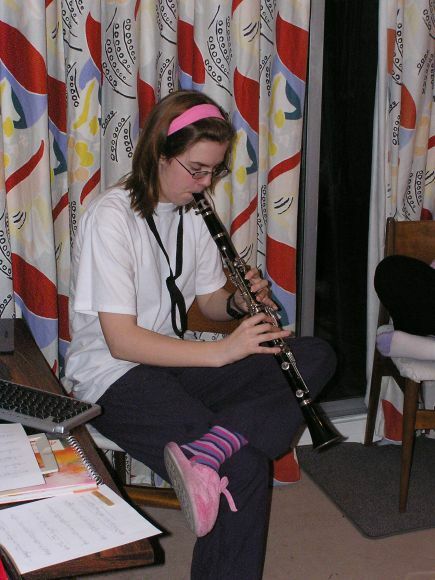 By the end of the Easter holidays she had learnt the basics herself, and by the autumn term she had graduated to the post of Principal Bassoonist for Shepshed Community Band! 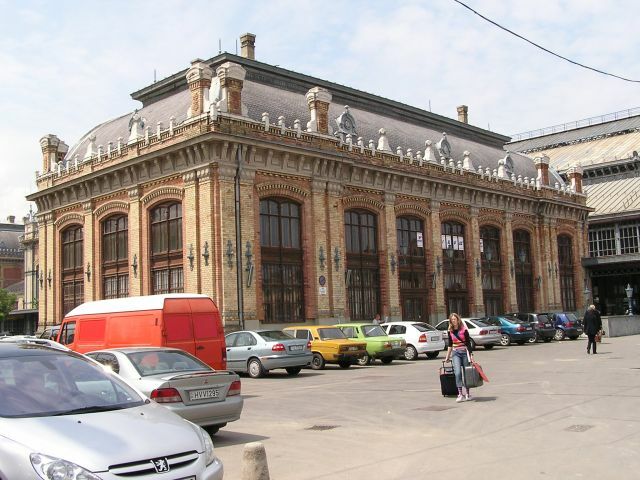 The skirt is one of her bargains from "Retail therapy" in Pest. Ceri-Siân also dabbled in other instruments. 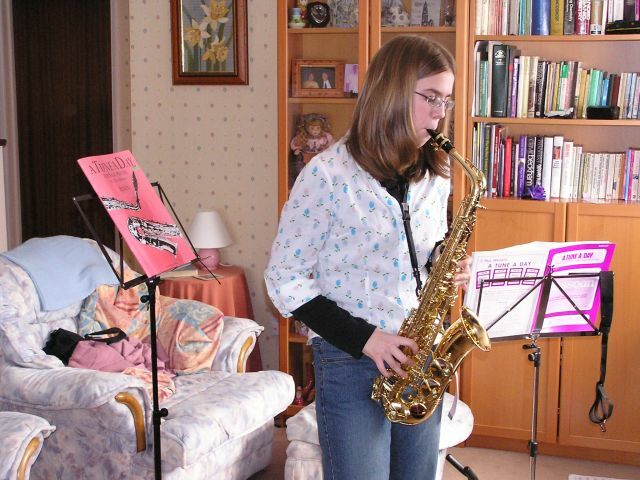 When our friends stayed at Easter, Ceri-Siân borrowed Caroline's saxophone and soon learnt to play a tune. Ceri-Siân playing piano with young Helen on her lap. Note the colour marks on the keys - they were for Helen's benefit, not Ceri's. After giving the piano a rest for a while Ceri has decided to take her first grade in the piano next year. Ceri-Siân has never flown before, so when Easy Jet announced that they were flying to Budapest, I immediately booked a trip for Ceri-Siân and I. This is the plane we flew back on, arriving at Budapest Ferihegy airport. Proof we got there - here is the Érkezés (arrivals) board at Budapest Ferihegy airport. Note our reflections in the glass. 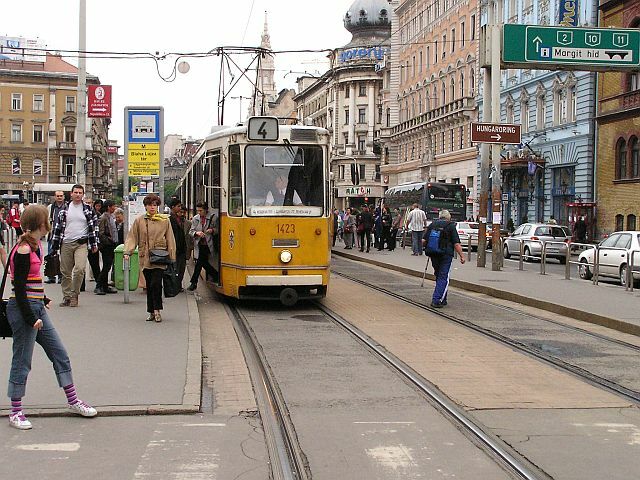 After a pleasant Tuesday evening being shown around the obscure corners of Buda and Pest by "Hamster" a fellow tram enthusiast who lives in the city. We had on Wednesday and Thursday "Hamster" weather, which in the world of trams enthusiasts means weather such as this - as when ever he reported about his trips to other places he always reported heavy rain. Here is Ceri-Siân being very patient and getting very wet whilst I spent some time photographing trams at a remote spot where routes 12 and 14 split. Ceri-Siân's patience came at a small price - retail therapy! Here she is in the centre of the city named in her honour - Pest, on the Grand Boulevard, wearing her nice new stripy tank top which went with her stripy socks! "Daddy hurry up we got a plane to catch!". The last morning in Budapest we got up early and left our luggage at Nyugati Pályaudvar (Western Station), whilst we toured light. When we went to collect our luggage I wanted to take more photos, so Ceri-Siân took the left luggage ticket in disgust and went and collected all of the luggage herself! 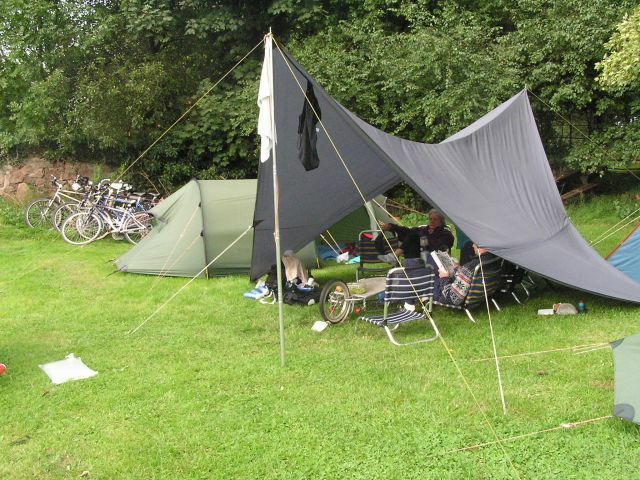 At the beginning of July we held our fourth and final Market Bosworth Family Camping Weekend for the Tandem Club. Here is Ann watching the children's entertainer set up to keep the sprogs happy whilst tea was cooked. Click here for a full photo report. "Its a wise child that knows her father". Melissa my niece joined Ceri-Siân and I on our cycle tour of the Netherlands. Melissa rode the tandem with me and Ceri-Siân rode solo. As Melissa's father is Philip, my twin brother, on a number of occasions she forgot who I was, and thought I was her dad! Click here for a full photo report. 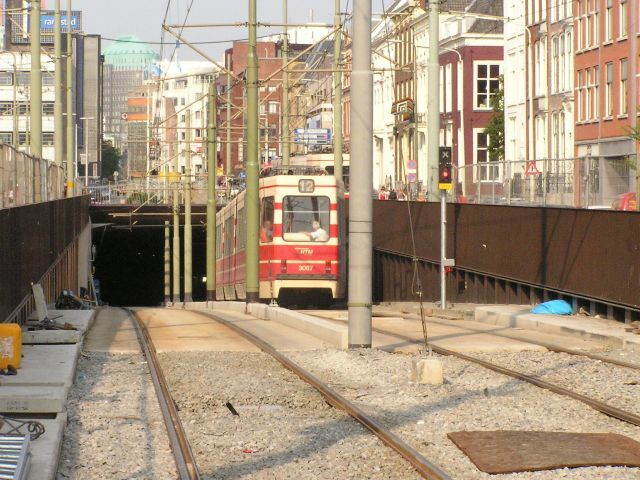 Whilst in Dan Haag I managed to capture a photo of a tram being tested in the new tram tunnel under Grote Marktstraat and Kalvermarkt, which got published in the November edition of Tramways and Urban Transit, the publication of the LRTA. In one of our visits to Nanny and Granddad's, we managed to capture a nice family photo of three generations sitting enjoying the sun. 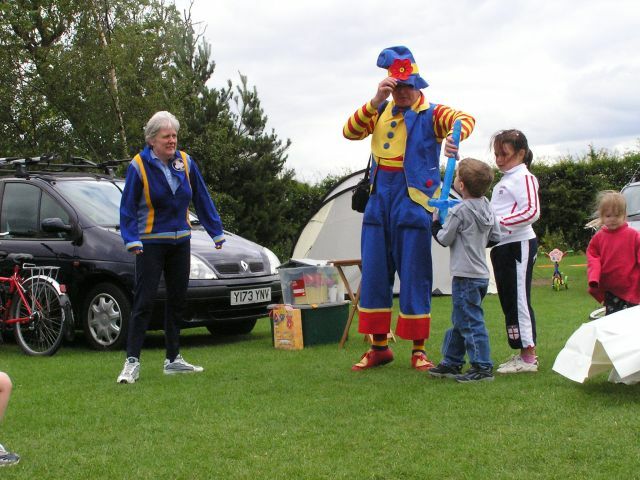 Family camp at the Camping and Caravan Club site at Weston Super Mare. Ann relaxing in the background whilst Ceri-Siân does the cooking using our petrol strove, a MSR Dragonfly. Note the flags being flown. these are flags Ceri-Siân and I have collected from NTKC sites from our two cycle tours in the Netherlands. The horizontal set is from our 2002 tour and the vertical set from our 2004 tour. Over the year, Ceri-Siân has matured into a true Dee. She was started to become a tea drinker! This is great as it means she likes the idea of stopping for a drum up. This is Ceri-Siân enjoying a cuppa whilst she studies the map on her first ride on her new half bike. The location is by the southern portal of the Sapperton canal tunnel. Following a clear out by both Ceri-Siân and her friend Emma, they had a car boot sale at Quorn. The one we did was not well attended, so they found time to do a cats cradle. 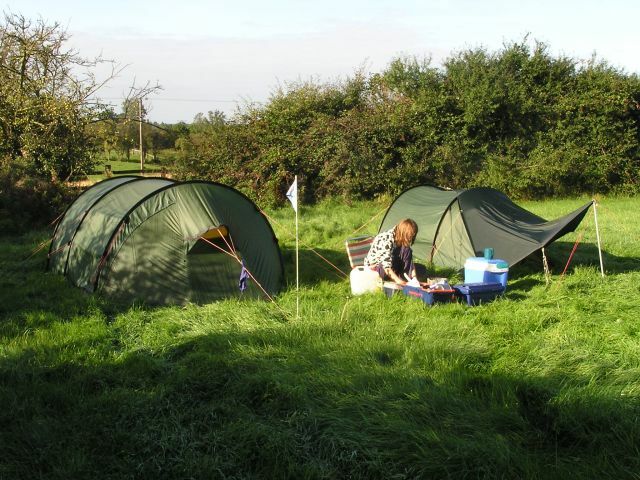 We camped at Mill Farm Quorn three times this year. On one occasion we even went by car for the first time. This was when we cycled camped with our friends the Jeffery's in September. Ann and Ceri-Siân relaxing before heading off home from Quorn. 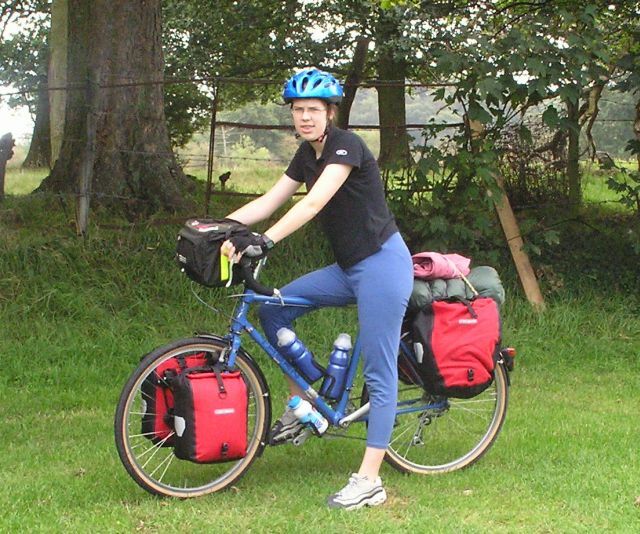 Ceri-Siân loaded for cycle camping on her half bike, ready to cycle home from Quorn. 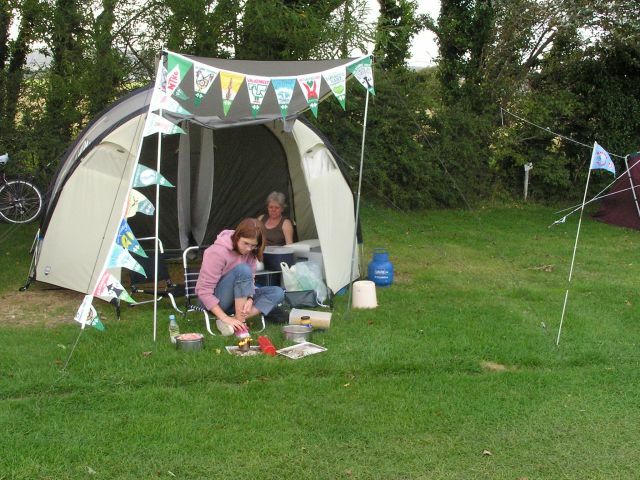 Ceri-Siân cooking tea whilst at the Association of Lightweight Campers AGM meet in Napton on the Hill near Rugby. The campsite long grass as the wet weather meant it couldn't be cut. Not only has she taken up doing all the camp cooking, she is now cooking most of the meals when at home at weekends. 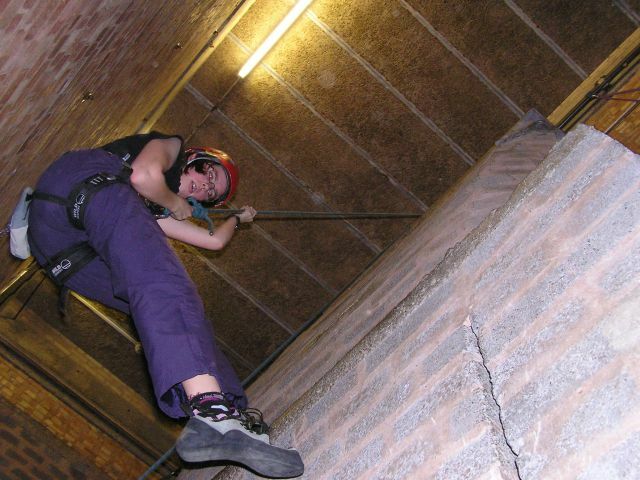 Ceri-Siân doing her final abseil as part of her Children in Need climb of the North Face of the Eiger, at Shepshed Community College climbing wall. Ceri-Siân playing her Bassoon alongside a professional musician on the first practise together with full orchestra for West Side Story at Hind Leys Community College. The professional musician was playing 8 instruments, from bass saxophone and bass clarinet down to the piccolo. The Sunday before Christmas is the Belton Mince Pie run organised by the local CTC. 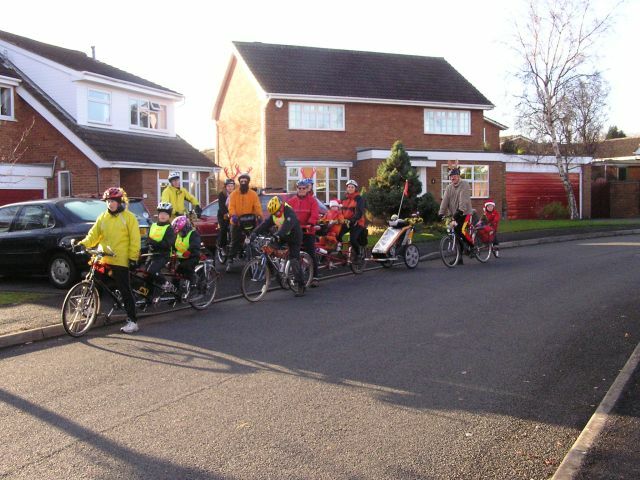 We try to arrange a family ride for the Tandem Club. This year we had a near record turnout with 2 triplets, 1 tandem, 3 solos, 1 trailer bike and 1 baby trailer..
Ceri-Siân summiting the hill back into Shepshed on the return ride. Note the antlers and tinsel. Out of shot behind Ceri is Father Christmas sitting on a few presents. After the ride to Belton, we had a Jacob's Join, and the other families got out their instruments. We had played cello, violin, oboe, bassoon, clarinet, piano and even the bombard. 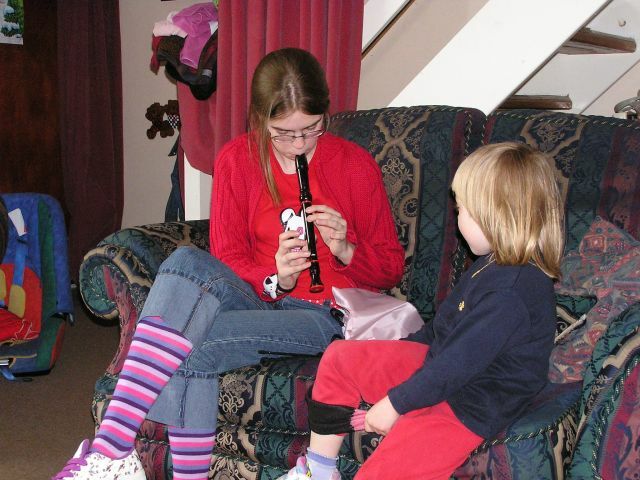 Here is Ceri-Siân trying out the clarinet.